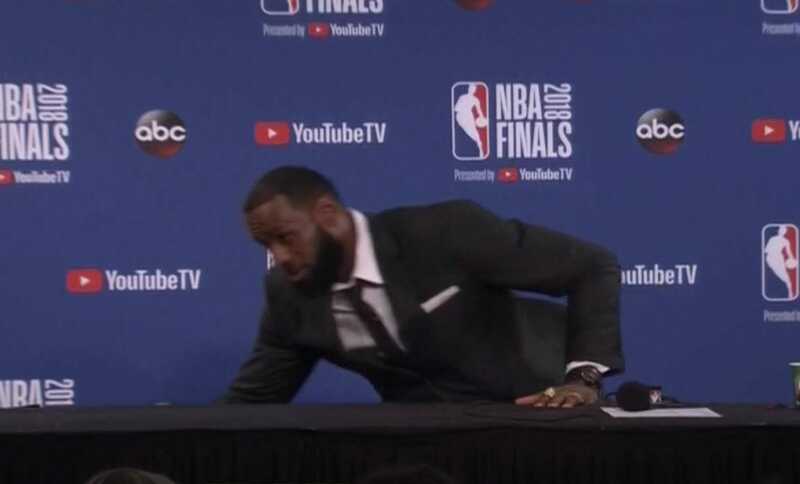 LeBron James shut down his press conference abruptly when a reporter pressed him on the the bizarre play by JR Smith that cost the Cleveland Cavaliers a chance to win Game 1 of the NBA Finals. With the score tied, Smith appeared to think the Cavs were winning in the final seconds and did not attempt a potential game-winning shot. After the game, James was asked repeatedly about the play and what Smith was thinking. The Cleveland Cavaliers lost a heartbreaker in Game 1 of the NBA Finals thanks to a controversial foul change and a bizarre sequence in the final seconds in which it appeared that JR Smith forgot the score. After the game, LeBron James grew frustrated by repeated questions about the Smith play as the media tried to determine what exactly Smith was thinking at the time. Mark Schwarz, ESPN: From talking to him after the play, what’s your reaction to it? What’s your version? Schwarz: Well, did he think the game was tied, or did he think you guys had it salted away? James: How do I know that? Schwarz: Or did you discuss it at all with him at the end of the play? James: No, they asked me if I talked to JR about it. I said no already [LeBron explains the basics of the play and score] I thought we were all aware of what was going on. That’s my view. I don’t know what JR was thinking. I don’t know the question you’re trying to ask. Schwarz: I’m just trying to see if you knew exactly what his state of mind was. Did he think you guys had it won or did you think he was trying to make a play? Are you not sure? James: What do you mean “Am I not sure?” No, I don’t know his state of mind. Schwarz: Do you know that he knew the score? 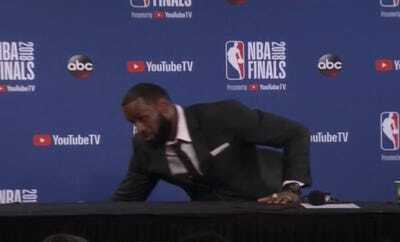 This was already supposed to be LeBron’s final question, but when it became clear that the question was not going to change, James got up and left. You can see the entire exchange here. LeBron leaves the press conference at the 1:10 mark.